Good advice, in small doses. Pomegranate is a beautiful fruit with shiny red seeds called arils inside it. These arils or seeds are eaten and also often juiced. It is a relatively low-calorie food with an entire pomegranate containing only 234 calories -ideal for anyone watching their weight.Termed as a Super food by health experts, it has several curative properties and is considered as one of the healthiest fruits available. Pomegranate juice has powerful anti-oxidants called Punicalogins which have been found to have 3 times the antioxidant activity of red wine, grape juice, cranberry juice or even green tea. A 100 gram serving of pomegranate seeds provides 12% of Vitamin C, 16% of Vitamin K and 10% of Folate. –High blood pressure is a leading cause of heart attacks and strokes. -Consuming pomegranate juice daily leads to a 5% drop in systolic BP. -It decreases the level of bad cholesterol (LDL) and increases the level of HDL (good cholesterol). -Pomegranate also reduces the formation of plaque in the arteries, keeping the heart and circulatory system fit. -A pomegranate salad, prepared with 1 pomegranate, lemon juice, salt, pepper and a dash of olive oil eaten regularly will keep your heart healthy. -Pomegranate is beneficial in maintaining a healthy gut. -Pomegranate seeds are an excellent source of dietary fiber and have anti-inflammatory, anti-viral & anti-tumour properties. -It is beneficial for chronic conditions like ulcerative Colitis and Crohn’s Disease. 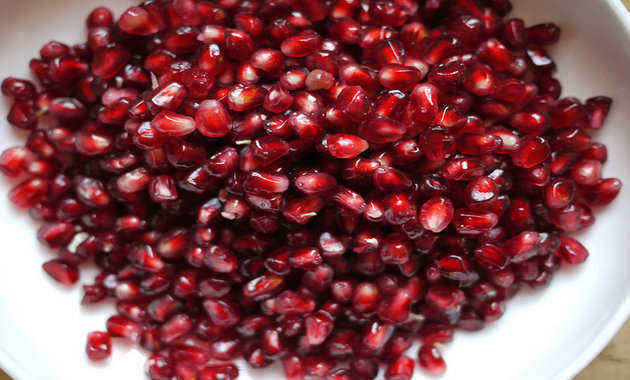 -De-seed a pomegranate and prepare the juice.Wash the skin along with the rind. And boil it with 2 glasses of water. -When reduced to half, cool it, strain it and keep sipping the water at regular intervals.This remedy has been proven to be extremely beneficial in controlling diarrhea and in reducing the inflammation in the small and the large intestines. -Acid reflux can also be controlled by mixing 2 teaspoons of honey in 250 ml of the juice and having it first thing in the morning. – If you suffer from bad breath, then pomegranate is the fruit for you. -Both the peel and juice of this ‘wonder fruit’ prevents dental plague which causes bad breath, as it has anti-bacterial and anti-viral effects. -Dry and powder the pomegranate peel and mix 1 tsp along with water and massage teeth and gums with this paste twice a day. -Gum related diseases such as swollen and bleeding gums are reduced with grinding the peel and mixing it with a pinch of black pepper powder and massaging it on the gums. -Pomegranate is packed with iron, a 100 gram serving of Pomegranate contains 0.3mg of Iron. -People suffering from low hemoglobin levels would do well to include a glass of this juice in their diet. -A tsp of dried pomegranate seeds (anardana) boiled with 2 cups of water, reduced to half, taken in every morning, helps increase the red blood count. Women suffering from a heavy menstrual flow would benefit from this as well. A beetroot could be included for added iron boosting effects. – Pomegranate is packed with anti-oxidants, and regular consumption of pomegranate juice has shown to prevent prostate cancer, and prevent all types of Cancers from spreading. -Recent research has also shown the benefits of Pomegranate juice in patients suffering from breast cancer. -Pomegranate has polyphenol antioxidants which inhibit the growth of cancerous tumours and the anti-inflammatory properties help reduce the size of tumours too. -Drink 250 ml of fresh pomegranate juice every day, add a dash of sea salt and a pinch of pepper for taste, avoid canned/packaged juices as they have too much sugar to reap any benefits. -The juice of Pomegranate prevents the onset of cartilage deterioration. -The plant compound in the fruit has anti-inflammatory properties and thus helps in reducing inflammation in the joints. -Severe arthritis pain or joint pain can be relieved by consuming a glass of pomegranate juice regularly. -The seeds of the fruit can be ground along with ‘chutneys’ to provide the sourness and can also be used as a side to everyday dishes for flavor, and freshness. The presence of Vitamin B, riboflavin, thiamine and niacin slows down the degeneration of the brain cells and could be a good protection against Alzheimer’s. The phenolic content of the juice, which has incredible benefits for the body, is adversely affected during processing and pasteurization techniques. Therefore, always opt for a fresh glass of pomegranate juice. Stay Healthy, Stay Happy with 1mg, India’s best e chemist ! 7 Reasons Why Gud (Jaggery) Is So Good For You! vvery useful tips of healty life. Thanks for giving such good knowledge related to pomegranate . Very nice information shared. Feel proud as producing pomegranate in large scale in Gujarat. Very great information which we shared. thanks a lot. que grandiosa informacion, yo no sabia que tenia tantas bondades esta fruta! thank you for your information…. I am a regularly eating pomegranade. But the cost is exorbitanat and sometimes the fruit infected and gets rotton with in a day or day. Very useful information. Today itself I started to use the pomagranate as a remedy of anaemic. Thank you. You can now consult a doctor on 1mg for free. Chat with our registered specialized doctors from anywhere. © 2017 1mg. All rights reserved.